CINCINNATI — Shannon Blalack was aware of crime happening in Northside, but this past week it hit too close to home for the co-owner of Melt when some of the restaurant's employees have personally seen an increase in violence. "One guy was at the ATM. He was held up by a knife," Blalack said. "Then, two guys that work here are roommates and they came home, their door was kicked in and all their stuff stolen." 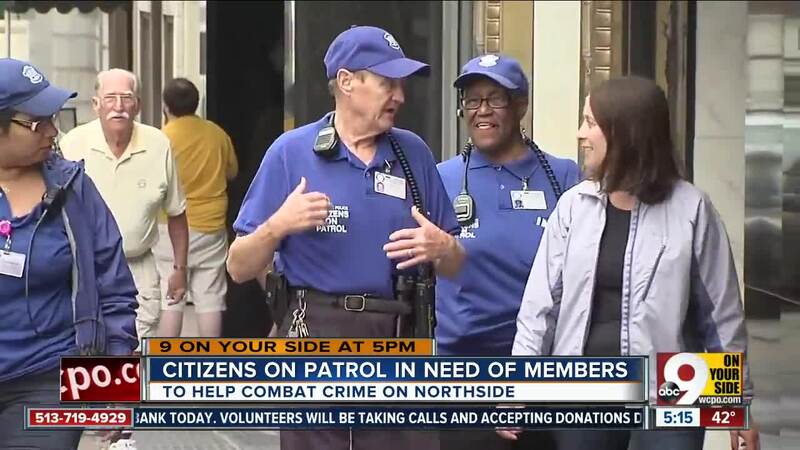 Blalack thinks part of the solution has to do with groups like Citizens On Patrol. The group works to keep crime down by being the eyes and ears for police who can't be everyplace at once. "We can't be everywhere," police Sgt. Eric Franz said. "They help us deal with problems that we, quite frankly, don't have the resources to do." The group finds and reports crimes and quality of life issues. But Citizens On Patrol is struggling to recruit more members. The group used to have 20 members 15 years ago, allowing them to be on the lookout every weekday. Now the number has dwindled to 10. "You have a group of people on a regular basis out patrolling in your area, that's letting the bad guys know it's not tolerated here because we care about one another," said Officer Princess Davis, the Citizens On Patrol coordinator. Davis is on the search for more members. But the long application can make people not want to participate. "When you have a lot more members, you can cover a lot more ground in a short period of time," she said. Davis said they're trying to get more millennials involved, as well. Anyone interested can email Officer Davis at princess.davis@cincinnati-oh.gov to request an application.